Shine On! Kids offers support and encouragement to very ill children and their families around Japan. While Japan boasts one of the best medical systems in the world, it lags behind in the area of patient support. SOK is striving to redefine this concept in Japan. Shine On! Kids was created by Kimberly Forsyth and Mark Ferris after their experience here with their infant son, Tyler. The little boy spent most of his short life battling leukemia. They began by establishing The Tyler Foundation, which later became Shine On! Kids. The organization was officially certified by the Tokyo Metropolitan Government in December 2012. SOK has created innovative programs to meet the diverse needs of children coping with serious illness. Beads of Courage was introduced in 2009 at Ibaraki Children’s Hospital and is now in place at 18 institutions around Japan. Children undergoing treatment for cancer receive colorful beads at each step of their journey. In the course of treatment they can collect hundreds of these beads — each a tangible reminder of their strength and courage. This past summer SOK launched Camp Courage for Survivors, aimed at teenagers who have experienced childhood cancer. Participants met with young adult survivors to discuss their experiences, take part in workshops and focus on their own future goals. Another of their signature initiatives relies not just on human input but canine power, too — the Facility Dog Program, Japan’s first full-time therapy-dog program. The dogs debuted at Shizuoka Children’s Hospital in 2010, followed by the Kanagawa Children’s Medical Centre in 2012. A facility dog works full-time with the same handler and is a dedicated part of the staff at the hospitals. The dogs can access almost any part of the hospital, including patients’ rooms and bedsides, operating rooms and even the ICU. 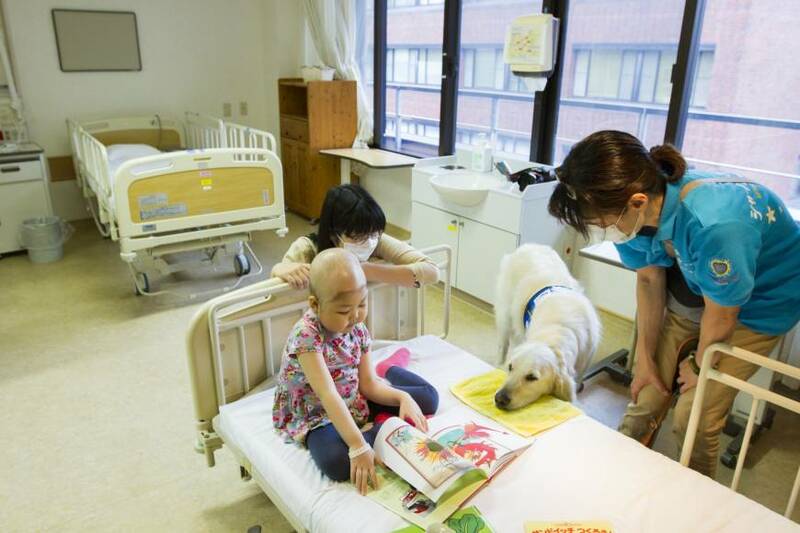 Persuading a Japanese hospital to accept a facility dog wasn’t an easy task. 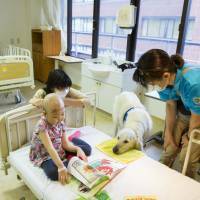 “When we placed our first dog at Shizuoka Children’s Hospital, we truly had to sell the hospital on accepting a free, full-time facility-dog team to work there. Now, we have hospitals asking us for dogs!” says Neely. All facility dogs are trained in accordance with Assistance Dog International guidelines, meaning the process is as rigorous as it would be for any canine assisting people with disabilities. As for the handlers, they too must go through a rigorous training course and regular follow-ups from the training organization and the head of the Facility Dog Program, Yuko Morita. Neely points out that the value of animal-assisted therapy, and canine-assisted therapy in particular, is finally becoming widely recognized. “This is one reason why SOK feels it is so important to measure the impact of our activities. There is no question that dogs make patients happier, but understanding how to optimize interactions to best support a patient, given their illness and their current physical and psychological state, requires more evidence-based research, which is an area that SOK is also currently working on,” she says. Neely says that SOK wants to demonstrate that the facility dog teams can save the doctors and nurses time and money, resulting in patients who are calmer and need fewer painkillers, and psychological benefits for medical staff and family members too. “We can then begin to make a business case for all hospitals to have a facility dog team as part of their staff,” she says. With one of the current Kanagawa dogs entering his golden years, SOK is raising funds for what will be their fourth facility canine, with a request for a fifth waiting in the wings. SOK will hold its annual fundraising gala on Friday at the Tokyo American Club, which this year takes the form of a “Jazz Soiree.” Tickets are available through the group’s website or Facebook page until the 16th. For more information, visit www.sokids.org.